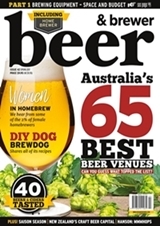 Beer & Brewer a consumer and trade quarterly title, is now in its sixth year of celebrating all things beer in Australia & New Zealand. The website is updated regularly and produces a free weekly e-newsletter – subscribe. Each issue of Beer & Brewer magazine serves up the latest beer news, lifestyle, travel ideas, beer & food matching, home brewing tips & recipes (in a flip cover magazine entitled Homebrewer) and tasting notes on local and imported beer, cider, whiskey and spirits. Beer & Brewer also publishes the Ultimate Beer Guide travel and buyers guide book, offer events such as the Beer & Brewer Expo, and the Beer & Brewer Awards.